In Journey To The West, we are looking at a Genesis Gaming title, one where the choice was made to rely on an ancient story of the Chinese for its theme. sIt’s a story that is not unique to this slot machine, with at least two other games using the same title and theme. The story involves some characters that don’t seem quite believable by the West’s standards, using monkey gods, pig monks and other characters. You see them all on the reels actually, designed with great care by Genesis Gaming and with gorgeous surrounding graphics. 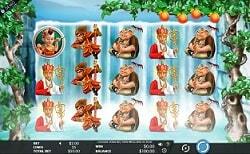 Overall, it is a very well designed slot machine, I have nothing to comment negatively there. There are no poker icons inside, nothing that looks like it doesn’t belong, and so I think that the developer did its job in this part of the game. The company, Genesis Gaming, has been formed in 2008, meaning that they had plenty of time to work on establishing a presence with the online casino industry. They’ve done just that, and they have a large collection of slot machines right now, over 150 titles being part of it. Many of those are good quality slot machines, though they have some older ones as well, of which I’m not as happy. Stick to their newer releases, and the odds of being disappointed are quite low. The game requires of you to keep its 25 active lines covered at all times, and in fact you are not getting the option to do otherwise. You may modify the bet, but it will only be the amount that covers each line. It will be multiplied by 25 each time, to get the total bet, with its range of $0.25 to $50. The line bet will vary from $0.01 to $2. This is not a particularly difficult game to play. You choose a wager, you spin reels and you take advantage of any features that might come your way, following the instructions on the screen when action is required. One thing to appreciate, compared with other slot machines, is the ability to form combinations which start from the left or from the right side of the screen, not just from the former side. Scroll Wilds are going to appear on the reels and they will serve as a way for you to get more wins as you play this game. Acting as substitutes, the wild symbols are replacements for most symbols, of the regular variety anyway, but they will not act as Prophet or Enemy symbols, at least not in the role which allows them to trigger features. Wilds may form combinations of their own if they are aligned in the proper way, and they can pay up to 100 coins. You can also get these wild symbols in stacked form. Some of the more interesting features will come via the Lotus symbol, particularly when it is combined with another type of icon. For example, you can trigger different Prophet features when you get the Lotus on reel 3 and one of the Prophet icons is present on the same column. Do the same thing with the Lotus symbol, but with a Skeleton Queen Battle unlocked, and you trigger the other feature. A top reward of just 100 coins is not impressive, even when you translate it into the actual cash value, which is $200 at most. The average RTP will make up for that, using mostly the features to get you there. 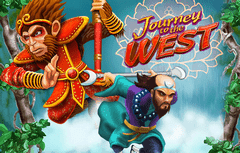 Journey To The West is a fun game, with unique features and high end graphics. The only downside I see is that the payouts are not going to be big motivators for anyone.